Posted June 13th, 2011 by BUTCH Voices. What is Masculine of Center and why does BUTCH Voices use that term? Masculine of center (MoC) is a term, coined by B. Cole of the Brown Boi Project, that recognizes the breadth and depth of identity for lesbian/queer/ womyn who tilt toward the masculine side of the gender scale and includes a wide range of identities such as butch, stud, aggressive/AG, dom, macha, tomboi, trans-masculine etc. BUTCH Voices has adopted the use of this term as way to be inclusive of the many identities that exist in our section of the queer spectrum. Masculine of Center serves as an umbrella term which is useful when discussing our community as it provides a succinct alternative to listing all identities. What identities are under the BUTCH Voices umbrella? Butch, Stud, Aggressive (AG), Macha, Dom, Tomboi, genderqueer, two-spirit, Trans men and Trans women who identify as masculine of center and all other similar identities. Who is welcome at BUTCH Voices events? Everyone is welcome to attend any BUTCH Voices event that is not a closed space. Those are usually noted as to who is welcome, as we believe in the need for both inclusive and exclusive spaces to connect as masculine of center individuals. Our National Conference and Regional Conferences are open to the various identities that fall under the BUTCH Voices umbrella and our allies. Is BUTCH Voices trying to tell me how I identify, what if I am BUTCH and not masculine of center? No, BUTCH Voices affirms the ability for each person to self identify in a way that fits them best. When BUTCH Voices uses the term Masculine of Center (MoC) the intention is to quickly and succinctly summarize who we are at large. 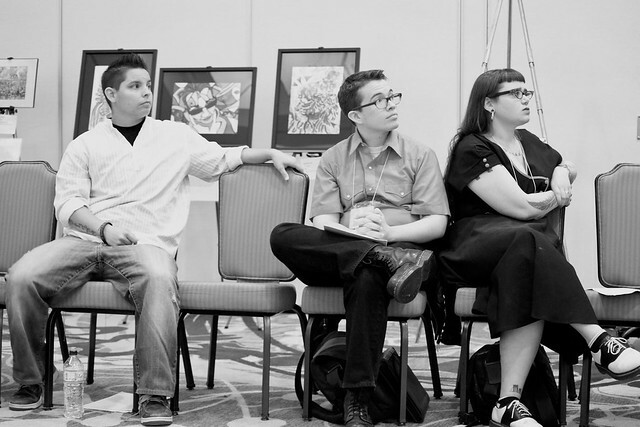 For many in our community, the label BUTCH is not inclusive, but we all unite at our National Conference under the big BUTCH Voices tent, because of our shared experiences. Are allies welcome at BUTCH Voices? Yes, allies are welcome as attendees, and are welcome to submit proposals for our events. These should be focused on issues that butches and masculine of center folks face. Priority is given to masculine of center individuals.